Welcome! to the first ever clan for Core-Exiles, a PBBG based Epic Space game. When the outcast of the Core started to fill The Sphere territory it was plain to see that loners would find it impossible to survive. This is when two brave men came together and brought about the creation of a clan which shall for ever be known as "Shields-Down." They felt that this name was the only suitable choice, should enemies approach and attack; Where our allies shields fall we will be there, we will strike back the pirates and we will save our comrades. Should other pilots foolishly make themselves enemies of Shield-Down... We Will Make Them So! Their shields shall fall, their ships shall fall and they will fall. TL;DR: Fell out with PHP (site program language), but new tech means I'm rebuilding the site from scratch using a new PHP framework. No timescales yet, but I will be opening a "build schedule", progress, and a "poke" to keep me active. More info later. Some of you will have noticed this site is built in PHP, but I would imagine only a few of you will realise that I coded this site over 10 years ago. Back then I didn't know anything about keeping my code tidy, readable, user-friendly etc. and that's hindering my development efforts as some of my code is, well, scary. Real scary. But at the time, this code worked and I had no need to go back and re-do it; I had so much more I wanted to code instead. This was a mistake. And I'm paying the price for it as every time I revisit the code to redevelop it, I shudder and lose motivation, easily becoming distracted. 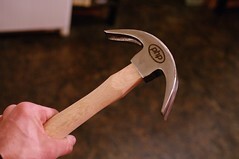 This also came with the famous "PHP Hammer" (and related article, well worth a read if you code). I laughed when reading the "bugs" on PHP as about 3 of the issues I was experiencing were documented, and to be completely honest, I lost every ounce of motivation for PHP. And, hence, the site wasn't updated since. But another article recently appeared, stating "Why 2013 is the year for PHP" and it appears the latest versions of PHP has fixed a number of the issues that I experienced last year, and included a number of new, needed functionality (finally, literally!). The release for this PHP 5.5 is in Feb/March, and I for one cannot wait. There's also been a large amount of chat about a new framework, Laravel and I've heard nothing bad about it. So that's what I'm using, and after 3 days I am absolutely loving it. I still have a ton of coding to do before I can get close to having a website online, but it's progressing nicely and I'm not being blocked by constant "tweak this" and "re-work this". It just.. works. And as a coder, that's all I want for now. So, that's my plan. New PHP Framework, starting from scratch, and to keep me motivated I'm also going to make my "todo" board public where you'll decide what's more important, and help me decide what to work on next. I'll also have a "poke" button so if I do go quiet again, you'll be able to poke me for an update and/or to get it done. I hope this will be a new era for Shields Down, for myself, and something you will enjoy and use in the future. The EU will soon put into force the ICO cookie EU directive which basically means websites must explain if cookies are being used, how they are being used and in some circumstances allow the user to opt-in before the cookie is created. Some work is required to make this site comply with this directive, but I thought this would be an appropriate time to explain the current situation and what needs to be done. So in a nutshell - there may be some "behind the scenes" changes to how cookies are handled, also I may have to temporarily deactivate the login section of the site next month (I'll warn you all before that happens). Current Lottery Jackpot: 106,400 Credits!